Are you searching for a gift that will keep her smiling every day? 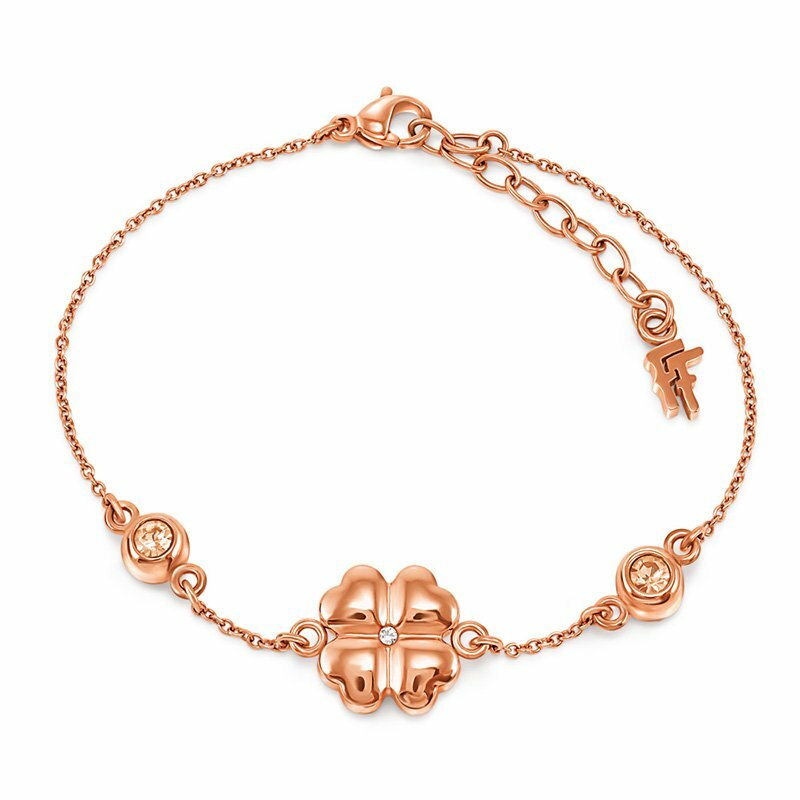 What could be better than a beautiful rose gold plated Folli Follie bracelet. The four hearts intertwined in the shape of a four-leaf clover will show her your affection, whilst bringing yet more luck to the love of your life (she already has you!). When you see the name Folli Follie you see love, emotion and uniqueness. Folli Follie brand jewelry is rich in detail, and complemented by exquisite style. You can opt for a flower ring, a bracelet of hearts or of a four-leaf clover. Each piece will be able to help you convey your message to someone special. If a special someone’s birthday is coming up or perhaps an anniversary or you just want to get them a present, just because. This Folli Follie jewelry collection will be just the right choice. We guarantee that the recipient of your gift will be speechless as they see the beauty of this jewelry. Featuring cubic zirconia, rose gold, stainless steel or silver, your options are limitless. And all of this can be easily delivered right to their front door. They say a diamond is forever, but we say that in reality it is all jewelry that is forever, especially the pieces from our Folli Follie collection. They are forever thanks to their elegance and attention to detail! It will be a gift the recipient will want to treasure for a lifetime. The most magical day, of course, will be when your special someone hears a knock at the door and sees the courier delivery this beautiful gift right to their door. Her eyes and heart will fill with joy and her thoughts will automatically go to you! Whenever she wears it, whether for nights out, to the office or just day to day, she will always be reminded of you and this thoughtful gesture. Folli Follie jewelry, is in fact suitable for any occasion, from the most elegant occasion to the most casual. You can choose from rings, bracelets, necklaces or earrings, according to your tastes and those of the recipient. Each piece will shine brilliantly on the special lady that receives it. Many times you may walk into a jewelry store, see the perfect item for your partner then see the price tag and think it’s just a little too high. Well, FloraQueen wants to be your trusted online jewelry store, giving you the best online jewelry at great prices. And that just got even better with our new Folli Follie collection. The Folli Follie brand is characterized by elegance and refinement, for being able to communicate feelings and emotions through details. For example, a ring in the shape of a four leaf clover will bring good luck to those you love. And as if that weren't enough, the four-leaf clover has four hearts, because in addition to luck we need love, lots of love. It is this kind of sentiment that you can convey by choosing a piece from the Folli Follie collection. Beautiful Jewelry delivered right to their door. You want to see her smile, tell her you love her and that you can’t live without her. Perhaps, however, you live far away and do not get to tell these things in person as often as you would like. FlorQueen’s expert shipping and delivery services ensure that you will be able to send her those sentiments right to her door, so you will be able to make her smile and show her your love even from afar. Carefully select an item from this gorgeous Folli Follie collection, a piece that you know she will treasure and wear regularly, if you’d like you can easily send a long a card with your sentiments or perhaps a teddy bear to show her sweeter side. Then leave the rest to us. We will make sure that you gift is carefully hand delivered right to her door! She’ll be thinking of you every time she sees the jewelry that you so carefully selected just for her.